ThinkPad Edge Series laptops might jar purists with their progressive, strikingly clean look. 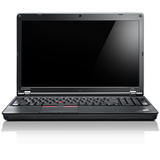 But they retain renowned ThinkPad durability and reliability features. Spill-resistant keyboard? Check. Active Protection System? Rescue and Recovery? Check, and check.